While certainly ancient in its’ origins, there is still a lot of unknowns when it comes to cannabis and its’ effects on humans; young and old. Compared to other “illicit” substances, we are decades behind in scientific research and clinical trials on the drug thanks to prohibition. 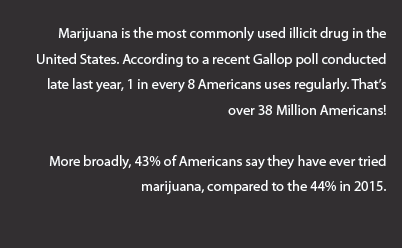 By federal law, the possession of Cannabis is still illegal in the United States, except within approved research settings; however, a growing number of states like Colorado and Washington, and even the District of Columbia have enacted laws to legalize use; for either medical or recreational use or both. Marijuana has shown a considerable amount of promise for treating various medical conditions including pain, muscle spasms, seizure disorders and nausea from cancer chemotherapy. At least some of those benefits are thought to come from cannabidiol (CBD), a chemical component of the plant not thought to produce any mind-altering effects. Thanks to this progress and what can only be seen as a growing nationwide general acceptance of the plant, the U.S. Senate recently recommended that the Institute of Medicine further study the benefits of medical marijuana, and has also encouraged others to support more research on the plant. Much of the national debate over marijuana concerns keeping it out of children’s hands — and for good reason. There are many indications that weed can impair the developing brain, and some research maintains that the sooner young people start smoking, the more problems they’ll have down the line. Marijuana’s signature high comes from a psychoactive component known as tetrahydrocannabinol (THC) and evidence is mounting, that THC is not risk-free. 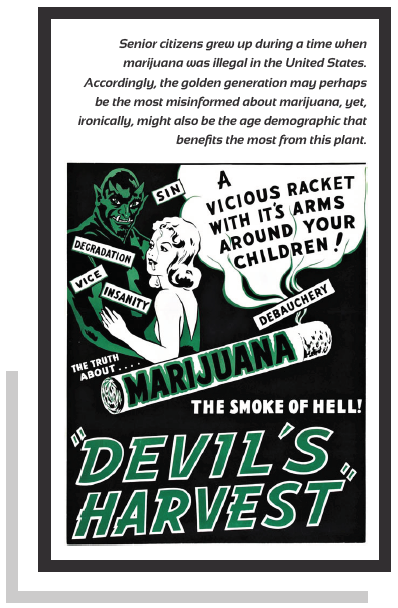 In the short term, marijuana use has been shown to impair functions such as attention, memory, learning and decision-making. Those effects can last for days after the high wears off, but no long term effects have been well documented. Heavy marijuana use in adolescence or early adulthood has been associated by some to less than favorable life outcomes including bad grades in school, higher dropout rates, lack of motivation, increased welfare dependence, unemployment, and an overall lower life satisfaction. Another recent study found that persistent marijuana use was linked to a decline in IQ, even after the researchers controlled for educational differences. There are some reasons to think that adolescents may be uniquely susceptible to lasting damage from marijuana use until at least ones’ early or mid-20s, “the brain is still under construction,” says Staci Gruber, PhD, a neuroscientist and director of the Cognitive and Clinical Neuroimaging Core and the Marijuana Investigations for Neuroscientific Discovery (MIND) Program at McLean Hospital/Harvard Medical School. During this crucial period of neurodevelopment which can last into your 30’s, the brain is thought to be particularly sensitive to damage from drug exposure. 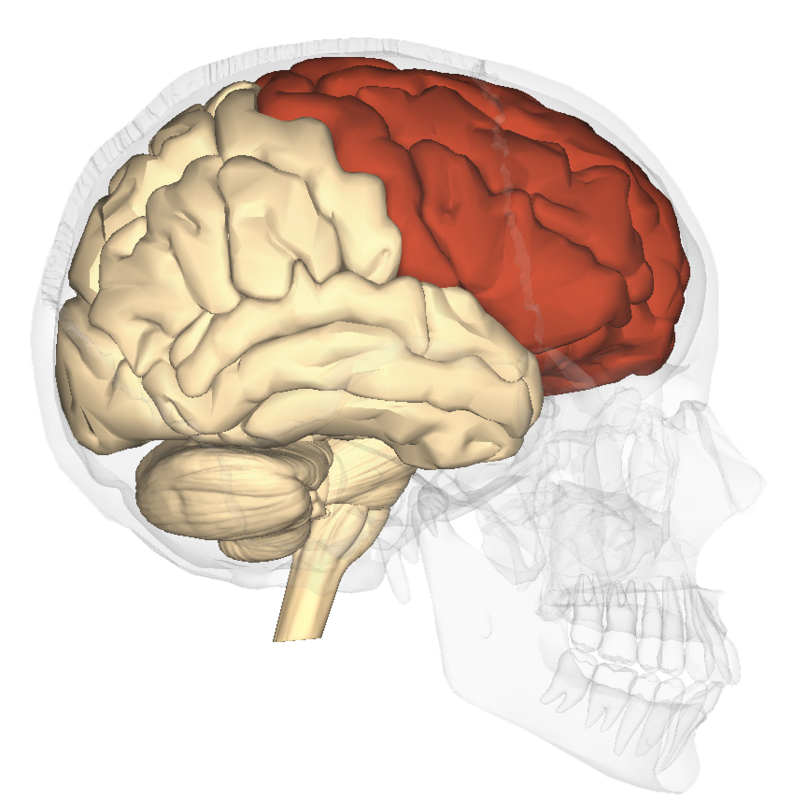 The frontal cortex — the region critical to planning, judgment, decision-making and personality — is one of the last areas to develop fully, Gruber says. the expanding access to marijuana, it’s many medical benefits, and a noticeable increase in the number of older marijuana users, scientists have begun to turn their attention towards the elderly. Most recently, a group of researchers from Germany and Israel published a study in Nature Medicine that examined the different effects of tetrahydrocannabinol, the psychoactive compound in weed that’s also known as THC, on young and old mice. Their findings were provocative: A low dose of THC, they reported, “reversed the age-related decline in cognitive performance of mice aged 12 and 18 months.” They traced this change to a shift in gene expression — the way that our DNA codes are transcribed and translated into proteins and other molecules. 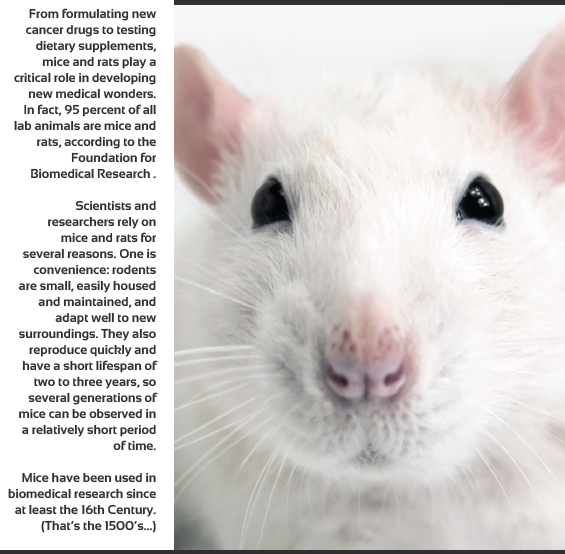 According to the study, “the expression profiles of THCtreated mice aged 12 months closely resembled those of THC-free animals aged 2 months,” as if the older mice’s brai ns were getting younger. The experiment focused on learning, spatial skills and memory. While older mice typically did not perform as well as young ones in mazes or with location-recognition tasks — an outcome consistent with the decline of brain function in aged individuals — they performed just as well as their younger cohort under the influence of THC. Meanwhile, younger mice given doses of THC demonstrated worse performance, more in line with that of average old mice. The findings have implications that reach far beyond a little boost in brain power. The scientists noted that the endocannabinoid system, a network of receptors throughout the body that responds to the cannabinoids in marijuana, “modulates the physiological processes underlying aging.” By targeting this part of ourselves for therapeutic treatment, we could theoretically guard against illnesses of cognitive deterioration including dementia. 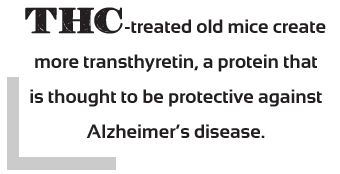 The study revealed, for example, that THC-treated old mice create more transthyretin, a protein that is thought to be protective against Alzheimer’s disease. 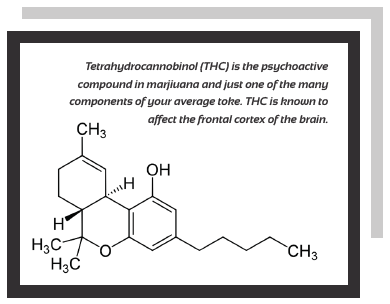 Of course, there’s still a lot we don’t know about THC. As we said in the beginning, prohibition of weed at the federal level creates a significant obstacle to studies like these here in the United States. And what’s good for a mouse isn’t necessarily good for your grandparents. But as more of these barriers crumble and fall, we may begin to discover benefits of medical marijuana that even its proudest advocates couldn’t imagine. Cannabis infused beverages are a great way to get your daily THC intake.